Take your Web site to the next level... build a database, connect it to your Web site, and display interactive pages to your users! Allow users to view, edit, delete, and add information to your Web site, and more. If you want to learn how to build an online database that can be used on the Web, then this seminar is for you. We will build tables in a Microsoft Access Database, and then use Active Server Pages to construct a live, dynamic web site. The example that we will use in class is a full-featured test-taking web site, where teachers can log on and create quizes and tests for their students consisting of multiple-choice answers. The students can then log on and take the tests and be graded. Microsoft Access and Active Server Pages (ASP). Notes: You do NOT need to use Microsoft Access for your database, and you do NOT need to use FrontPage as your web editor. You may use any database program and web page editor of your choice. The main focus of this seminar is how to write ASP code to access your data. This seminar will NOT cover the use of PHP or MySQL. We actually developed this seminar while recording the development of our very own 599CD Skills Test System - that you can log on to right now and take a test. NOTE: The free introductory lesson (see below) will show you all of the topics covered in this class, and discuss what you need to get started. So no matter what kind of online database you're planning to build, this seminar will give you all of the fundamentals and information you need to get started. You can then take this information to build everything from a customer management system to an online shopping cart... all of the fundamental concepts of working with online databases are covered in this seminar. All of the basics, from setting up your Access database to adding, editing, and deleting records, to passing and storing variables between your pages... are all covered. We will begin by setting up our database using Microsoft Access. Now, you do NOT need to use Access for your database. You can use any database program that you like, as long as it conforms to ODBC standards. If you want to use SQL Server or even Oracle as your database server, that's fine too. I personally prefer using Access for low- to mid-volume databases, and it's the easiest to set up. Our database will consist of just a few simple tables... one to store the names of the tests we want to give the students, another to store the questions, and a third to store all of the answers (multiple choice). If you've taken any of my Access courses, you'll find this part a piece of cake. I list Access 101 - 201 as a pre-requisite only because we cover table relationships in Access 201. Really, you'll be just fine even with Access 101 under your belt. Next, I will discuss how to upload your database to your web server. Now, for my personal setup, I use a Windows 2000 Server, and I use pcAnywhere to connect to my server and upload the database. However, your setup may be different, and that's OK (see below for details). After we learn how to display records from our database on the screen, we'll learn how to loop through records in a table. We'll display all of the records in our Test table to show a list of all of the tests available. This might sound easy, but it's actually quite an accomplishment for ASP code. Remember, there's no graphical editor to do this with. This is real programming! Next, we'll learn how to pass information between web pages using the QueryString. This allows us to send data from one page to another using the address bar URL. Next, we'll go through and create pages to display all of the questions and answers in our database. Click on a test to see all of that test's questions. Click on a question to see all of the possible answers. Next, we'll learn how to store information in the memory of the web server itself. These are called Session Variables and they are handy for remembering temporary information... such as the current user's name, or what test he's viewing. Data that doesn't necessarily have to be stored can be remember during this user's Web "Session." Next, we'll learn how to gather information from the user in a Web Form. We will be able to add tests, add questions, add answers, and get information like a username and password to log on to the web site. Now that we know how to get user input, we can add records to our database. We'll design forms to add tests, questions, and answers. Once we know how to add records, we'll of course have to be able to edit and delete those records. We'll create pages to edit and delete test names, questions, and answers. As a side note, we'll of course talk about the security of your web pages... making sure someone can't just hack into one of your ASP pages and start editing your data. Go ahead and try. Our online Skills Test System is as secure as any page can be (well, unless you guess my password). Side note: yes, while I do take a little bit of time to show you some formatting in class (tables, colors, etc.) I don't want to waste a whole lot of time on that - so you'll notice that my pages aren't exactly pretty at this point. However, if you really want to learn how to build attractive web pages, I recommend my Frontpage series of classes. Here, I'm just focusing on making the HTML functional, and the ASP code work with the database. We will next create the entire test taking engine... allowing the user to pick a test, and then be quizzed on each of the questions for that test. The student will get progress shown with each question, and can see what the correct answer is if he misses it. 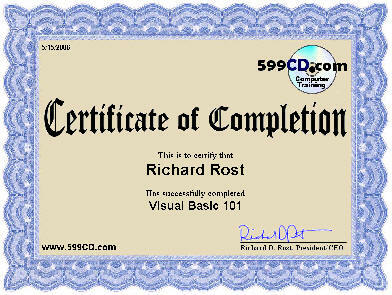 If the user answers at least 80% of the questions correctly he will be able to print out a Certificate of Completion. Finally, it's always nice to know when a user does something on your web site. We'll teach you how to send email using your web server. This way I am notified any time one of my students completes a test... you can also use this to contact the user directly from the web server. Being able to send mail is a very handy feature. Now, if you're not sure as to whether or not you can get your web site to work with ASP and an Access database, we have provided the first couple lessons of this seminar for you to review free of charge before you buy the complete package. If you've taken my ASP 101 course and have been able to use the lessons in that tutorial, then your server is fine as far as ASP is concerned. If you have your web site hosted for you by an Internet Service Provider (ISP), and they're supposed to give you database access and ASP support, then setting up the database is usually a service they will provide for you. They will at least be able to give you instructions how to set it up on their server. The only time you should actually have to set the database up yourself is if you run your own web SERVER at your own facility. Then you might have to go in and actually configure the DSN yourself. Again, I will show you how to do this step-by-step with Windows 2000 Server (almost the same for Windows 2003 Server). But if you don't have your own server, your ISP will generally perform this service for you. As long as you know how to get the database up to your web server, and can figure out setting up a Data Source Name (DSN), you will be able to use this seminar. If you can get these three steps working, you're good to go with the rest of the seminar. Again, I'll cover more detail in the seminar itself. use the lessons in this seminar. Note that this database is NOT for you if you do not have ASP (Active Server Pages) on your server. If you are working with the programming language PHP, then this seminar is NOT for you. Now save your page and load it up in your Web browser. If you see today's date displayed just like below, then ASP is installed and working properly. I have not tested the seminar code with the Linux operating system or the MySQL database, although if you have 100% support for ASP code, then you should be able to get it working - but I make no guarantees for support. To use the lessons in this seminar, I recommend you run a Microsoft Windows Server (2000 or 2003) which uses genuine Active Server Pages technology. So that just about covers it. This is a great seminar. If you have been looking to take a database and put it online so people can access your records, make changes and additions, and collaborate with you, this is the perfect starter kit. This seminar is long (just over six hours), but it's broken up into 26 easily manageable lessons of 10 to 20 minutes each. You can sit down, watch a lesson, review the material, test out the code yourself... and do a little bit each day. It's long, but it's comprehensive - you won't miss a single step as I've recorded everything from start to finish. You can use this information to create a customer database, a product or inventory web site, an online shopping cart, the list goes on. Once you know how to add, edit, and delete records in a database, the sky's the limit! Richard on 1/1/2007: Take your Web site to the next level... build a database, connect it to your Web site, and display interactive pages to your users! Allow users to view, edit, delete, and add information to your Web site, and more. Mary Gleeson on 2/1/2008: I would be interested in enrolling in this course seminar. Can it be ordered on CD or online? Richard Rost on 12/20/2009: James, anything is possible. Just add a "times taken" field to the Test table, and then any time the test is accessed (or finished - your choice) then increment that counter. Don't display it for anyone but you. james delaverson on 12/24/2009: Richard, am a little confused. I know how to make a field. I know how to increment a counter, but I don't understand the relationship between the field and the counter. Do I use "rs.update" like in adding "new test" or is this something different. Merry Christmas. No hurry for the reply. Thanks. Richard Rost on 12/25/2009: James, I'm sorry but I don't understand your question. Can you elaborate, please? james delaverson on 1/1/2010: You advise..create a field in database...then "increment that counter"...doesn't that mean that I have to write in the field in the database? and do I use rs.update to do it? Richard Rost on 1/3/2010: James, essentially you would add that "TimesTaken" as a field in the Test table. Then, at whatever point you want (when the test is started, finished, etc.) you would increment the counter. That would involve opening a connection to the table and adding 1 to the value in there. Benjamin Berks on 5/17/2010: I was able to set my access database to the IIS server on windowsXP pro. To do this I just saved my access file (created in the previous clips), to the location on my computer I wanted the DSN to point to. Then, I selected PROGRAM > CONTROLS. Then, click "Administrative Tools" and the TAB "Data Sources (ODBC). Next, click tab "System DSN" and ADD button. Next, scroll thru drivers to "Microsoft Access Driver". Next, in the field 'Data Source Name', I enter "SkillsTest". Next, click on the Database "Select.." button. And surf to the location on the computer I have the access file saved and click OK.
Now when the ASP page calls the DSN "SkillsTest" it will connect to this locally saved file thru the IIS server on MicrosoftXP Pro. "This example describes using ASP/ADO to connect to an Access Database. NOTE: This code requires full trust and will not work on hosting accounts running ASP.Net 2.0/3.0/3.5/4.0. db_dir = Server.MapPath("access_db") & "\"
db_path = db_dir & "yourdatabasefile.mdb"
response.write ucase(fieldname) & ": " & oRs.Fields(fieldname) & ""
What can I do to get a connection to my server? I have taken your ASP 101 course and it works with all your examples there with the response.write etc. Brent on 3/28/2011: I do not use Microsoft Front Page, I use Coffee Cup HTML 2010 for my html editor. My hosting is goDaddy, What GoDaddy is saying is that the code you use in your lesson requires full access, is there a way around this. I can not proceed any further with the lessons since I cant get a basic connection to the database. I also use GoDaddy for one of my servers. In fact, the 599CD Theater is hosted on a GoDaddy server (amicron2.com). You must have just gotten a tech rep who doesn't know what he's talking about (happens ALL the time to me... and not just with GoDaddy). Do you have MICROSOFT hosting or their Linux hosting? With Microsoft hosting, FrontPage will automatically set up the READ/WRITE permissions you need for the folder that contains your database. This is one of the reasons I love FrontPage (now Expression Web). Even without FP, however, you should still be able to use their file manager to go in and set the permissions for your database folder so that the Internet User account (your server) has access to WRITE to the database folder. Without write access, you won't be able to write information to your database file. Can you READ info from the database and display it on your web page? SQLStr = "SELECT * FROM TestT"
Go down about half way down the page and watch lessons 15 and 16. It doesn't require a dsn. I've heard you say that you are using Frontpage for your web design. I use to use Frontpage 2003 but no longer have the software, so I was wondering what you thought of Expression Web instead of Frontpage for web design work. Honestly, I'm not too happy with it. I have Expression Web 4 on one computer, and it's got some nice new features, but I still prefer FrontPage 2003. I use FP for the bulk of my design work. EW just seems to clunky and clumsy. Maybe I just need to get used to it... but I've been using it on and off for a year now and still think FP is better. But, what are we going to do? Microsoft has dropped FP, so we best get used to EW, eh? "On The Ordering Page I dont see anything on it just on this page? I believe it's listed under the ASP courses. I need to double list it under Access too. gel on 1/8/2015: Hi Rick! just want to ask if printing of reports are also covered here in details...i find your tutorials easy for me to understand..anyway even its outdated i still able to upload and create web pages using classic asp...i knew it will take some time for you to continue the asp lessons. You can just print the webpage. I'm not sure of your question. Which Form? An Access Form or a Form on a webpage? This course is more about putting the details of the db on the web and viewing it in a browser. If you want to learn about Reports in an Access db and printing those you'll want another course. Just style the page using CSS and you can use the print functionality in the browser.